But first, some more bad news: “Many of these products contain a ‘bit’ of chicken followed by a slew of other ingredients, including white flour [which is terrible for your waistline and your pancreas], starch, salt, oil, phosphates and other preservatives,” Hunnes explains (one study suggests that phosphate additives contribute to the prevalence of chronic kidney disease). “I would never encourage anyone to eat these items on a regular basis.” And that’s not even mentioning the possibility of bonus mystery ingredients like, y’know, rubber. 1. 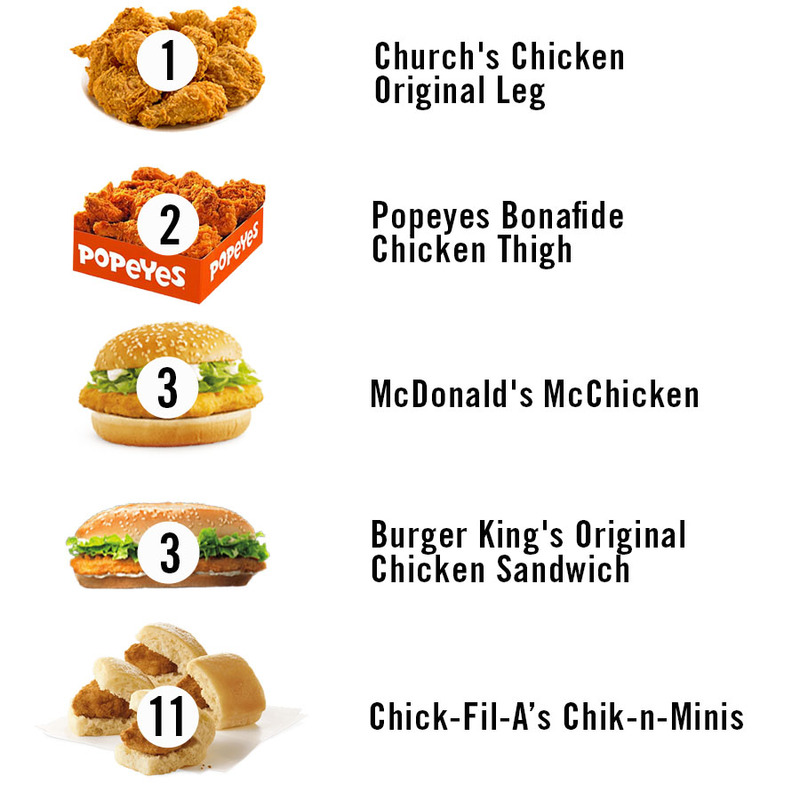 Church’s Chicken Original Leg: “This has fewest calories and is the most ‘naturally-occurring’ product on the list, meaning the leg isn’t overly-adulterated, except with the addition of some flour and a lot of salt,” Hunnes explains. One Church’s Chicken Original Leg contains 150 calories and 400 milligrams of sodium, which is somewhat reasonable considering we’re talking about fried chicken — the American Heart Association recommends consuming no more than 2,300 milligrams of sodium per day, and in an ideal world, they say that most adults should have no more than 1,500 milligrams per day. That’s because too much sodium has been linked to high blood pressure, as well as increased risk for heart disease and kidney disease. 2. Popeyes Bonafide Chicken Thigh: Hunnes explains that this is a close second because it only contains 10 more calories and 60 more milligrams of sodium. “It’s a chicken thigh covered in flour and a lot of salt,” she says, bluntly. On the plus side, chicken thighs are good sources of monounsaturated fats, which are considered to be one of the healthiest fats, since they lower cholesterol, and therefore, reduce your risk of heart disease and stroke. That said, frying them, as we learned from the above study, most likely negates any of these positive effects. 3. McDonald’s McChicken and Burger King’s Original Chicken Sandwich (tied): “Because these are larger pieces of meat than, say, chicken nuggets, they contain less flour [carbs] per serving of chicken since there’s less surface area,” Hunnes explains. (To clarify, Hunnes is saying that one large piece of fried meat generally has less unhealthy fried material on the outside than, say, a collective bunch of small nuggets.) “However, the bun [more carbs] makes up for that. But you do get some vegetables with these sandwiches, and since these are more of a meal than a snack, you’re probably more likely to treat them as a meal by not overeating.” Personally, though, the fact that a McChicken is basically $1 makes it incredibly easy to purchase (and consume) a whole bunch of them in one sitting, which is obviously a bad idea (but also the best idea I’ve ever had). 5. Chick-Fil-A’s Chicken Sandwich: “The only vegetable I see on this is a highly-salted pickle,” Hunnes emphasizes (also: That’s what she said). “I’d say this whole meal is a salt lick that lacks fiber and contains far more processed flour than the other items.” She’s right: This chicken sandwich contains a whopping 1,350 milligrams of sodium. 6. McDonald’s Chicken McNuggets, Burger King’s Chicken Fries and KFC’s Extra Crispy Tenders (tied): “These look about the same to me in terms of what’s actually in them — again, mostly a little chicken and a lot of flour and salt,” Hunnes says (four chicken McNuggets contain 340 milligrams of sodium, an order of Chicken Fries contains 850 milligrams and a single Extra Crispy Tender contains 310 milligrams). “These would be treated by most adults as a ‘snack,’ rather than a meal, which means these might encourage overeating.” You mean ordering the 40-piece McNugget for myself is too much? Fack. 9. KFC’s Popcorn Nuggets: “These are close behind the three listed above — again, for the same reasons, but they’re higher in salt and flour per gram of whatever meat might be in them,” Hunnes explains. A large order of these Popcorn Nuggets — because, c’mon, everyone orders a large — contains a whopping 1,890 milligrams of sodium. So on second thought, maybe a life without fried chicken is actually the only way to keep on living. If you can call it that.